Damn, this has been a rough month! Whoever decided to short us a day in September had zero concept of what it takes to keep a blog greased and running. Otherwise, they would have put like 45 days in each month … maybe 31 in February. The good news is the last post put me at 5 which was a comforting position knowing I had a super cool post waiting in the blocks. By super cool I mean THIS BIRD! How awesome is that!?! I realize that non-birders out there may be untying their shoe about now in order to violently fling at their monitors, but those that enjoy the world of aviary are surely intrigued. 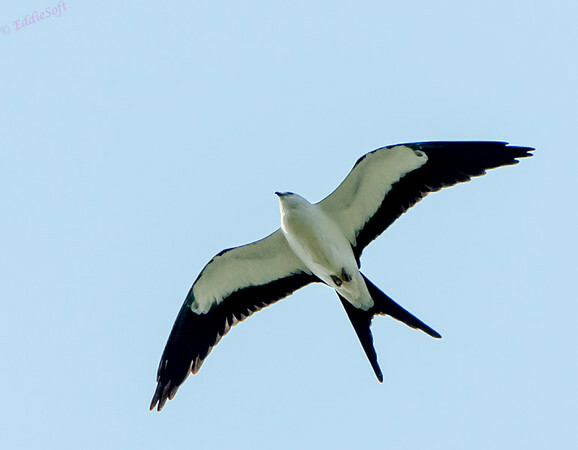 Those individuals not lucky enough to live in or travel to the Florida costs or better yet to the heart of South America probably have no idea what this particular bird is. Actually, I have traveled to the Florida coat but never spotted one of these magnificent gliders. 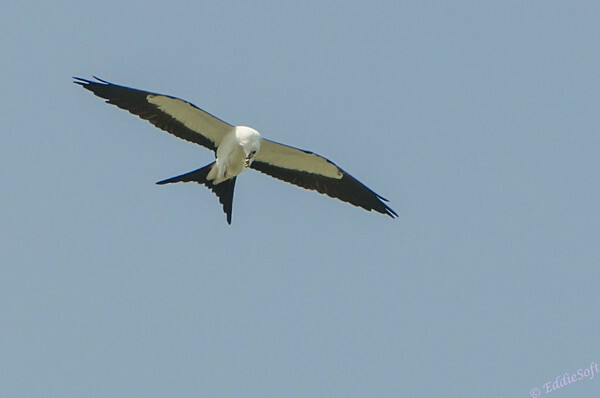 To save you hours of looking through reference books, this specimen is called a Swallow-Tailed Kite. Hit the jump to read more about this majestic bird! Without question, I refer to this bird as the second best bird in my current Life List. My favorite bird from the list hasn’t made its appearance on the blog yet so I’ll leave the suspense hanging there until that happens. Sorry about that, but hey, I did bring this one all the way forward from the back of the queue. This bird was actually shot earlier this month in a very unlikely place. The word went out on a birding forum my brother and I belong to that indicated this bird was spotted in Champaign, IL. My Alma Mater! I didn’t really think much about it likely thrown off by the name thinking it was just another Swallow. More and more reports were coming and and there was a high amount of excitement being stirred up. Pretty sure it was in the third week of people witnessing its presence when my brother decided to head down there and check it out. Linda and I had a photography shoot scheduled for that weekend which locked me up for most of the time or I probably would have just met him over there. Ron was worried that the bird might take off before he got there with his arrival time in mid-afternoon. It wasn’t too long after that we touched base and he confirmed that it was there and he got it in the tin! His account of the experience was similar to the other reports on the forum so this was obviously a site to see. Putting a cherry on the trip he also indicated he was able to shoot a Yellow-Crowned Night-Heron which is another bird I do not have on my list. That night I wrestled with the decision to head over there. I had the photography shoot still going on, a training run to get through and a crap load of work to get done around the house. Then again, it was a confirmed cool bird and when I did some quick research realized just how far it was out its normal territory. After some lengthy internal debate and agreement from Linda I could skip out of the shoot a little early, I decided to trek down there myself. The tipping point was the chance to add the Yellow-Crowned as well. Two birds is worth the round trip ~3 hour drive. Ron helped me out and provided excellent directions complete with annotated maps! I was not expecting the spotted location being just off a busy road and edge of a normal subdivision. Basically it was hanging out above a small field in the Southwest part of Champaign. I had to park on a side road to stay off the main busy road. It also took me an entire 2 minutes before I located the bird. The locating was assisted by the two groups of people hanging out on the sidewalk staring up into the sky. I quickly confirmed the previous accounts – this was an amazing experience on multiple fronts. First off this bird is unlike any other raptor I’ve ever seen. They have a huge wingspan (48″) and a well defined split tail. 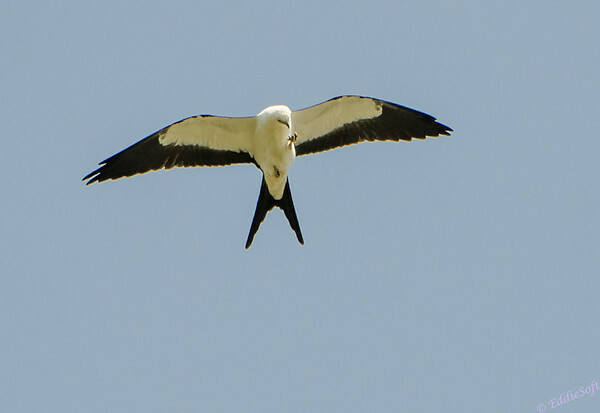 This wingspan allows them to ride the air foils like a kite (yes, as in the bird’s name). I’m not sure I ever noticed it flap its wings – just made large sweeping circles as it traversed high above the field. The other amazing experience was interacting with the other birders that were there. Many of them I recognized from their posts but had never actually met. The common theme so far is most birders are generally inclusive people and quickly welcome into their fold anyone with a common interest. My very social brother had already personally met many of them and put the good word in for me! It was also satisfying to see how all the locals embraced the excitement as well. You could easily see how imposing this event was. Strangers from all over the state showing up to stand on their sidewalks. A bit unnerving to basically have a flash mob show up outside your house. Instead, people were coming up to us and asking if we’d seen the bird, others coming to give us status updates of what happened after people left for the day and people would even drive up and stop on the busy street and ask us if we could show them where the rare bird was. I ended up staying there at least 2 hours talking, snapping, talking some more, snapping some more and having a great time. 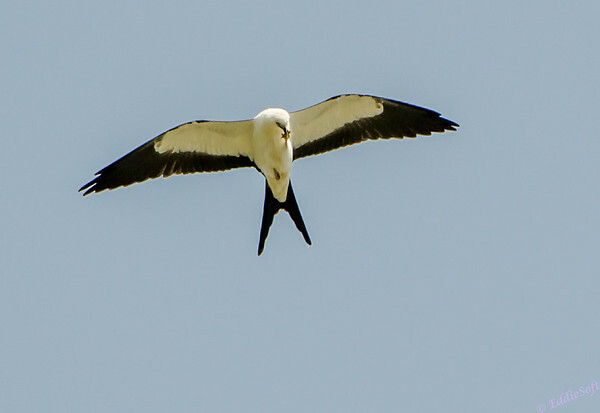 The main interesting fact about this bird was its inclination to eat while it was flying. This was easily confirmed by closer inspection of the shots in the digital dark room. Sure enough, there were plenty of shots in the tin where it was eating dragonflies out of its talons like a Popsicle. If you look close in the shots above you will see examples of this fast food approach. It never occurred to me that dragonflies go to such altitudes but clearly this specimen was having no shortage of prey. For the curious, I also added a shot of its back which is basically a solid slate gray. To say I was glad that I went would be an understatement. Big thanks to my brother for trekking down there first and assessing the situation. 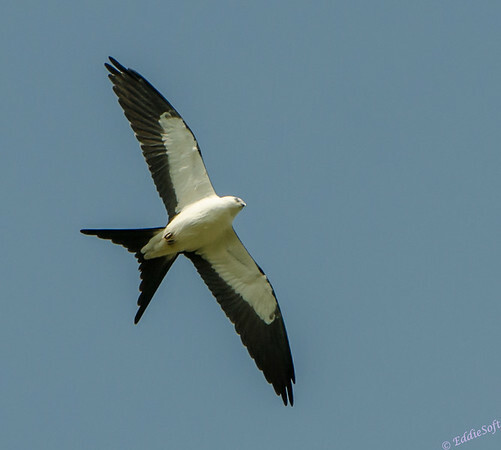 The Scissor-Tailed Flycatcher was already the big miss of the year that keeps me up at night. Didn’t need another one of those regrets. If there was a damper on the day it was the failure to get the Yellow-Crowned Night-Heron in the tin. There was even a nice couple (birders my brother had met previously) that helped me look for them. We did get a juvi Black-Crowned Night-Heron and a Green Heron but both of those were already checked on the Life List. Oh well, it was still a very successful day. Looks like I just got there before it decided to take off for good. That following day it was spotted around 3 or 4pm for the last time. Based on the survey someone did, people were making their way to Champaign from all over the state to witness this bird for the first time. A big thanks to whoever spotted this unique bird – it is a very satisfying +1! That WAS a super cool bird!! 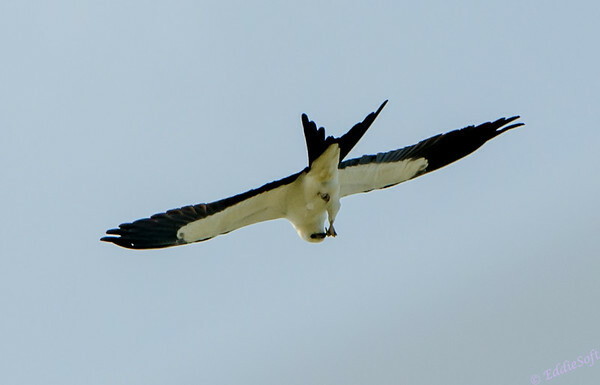 And while sometimes a bird in a reference doesn’t look nearly as good in “person”, this bird was a fantastic sight to see, soaring around and then tucking its wings in to accelerate like crazy downward. I was blown away by it. It soared for hours without landing, which is why neither of us have a photo of it perched in one of its favorite trees. It didn’t care about people watching it, and as you say locals were stopping and watching it with birders who traveled many, many miles to see it. Thank goodness it didn’t leave until the next day after you were there. It’s a big commitment to drive all the way there and back, and the whole time I was going there I was pondering whether I was out of my mind and hoping it would still be there in either case. Everything about this bird is striking–not just its size, vivid contrasting tones (I keep thinking “Space Ghost” when I see the pictures) and flat-out soaring, but also the small, pretty head and small talons. How rare is that for a raptor? 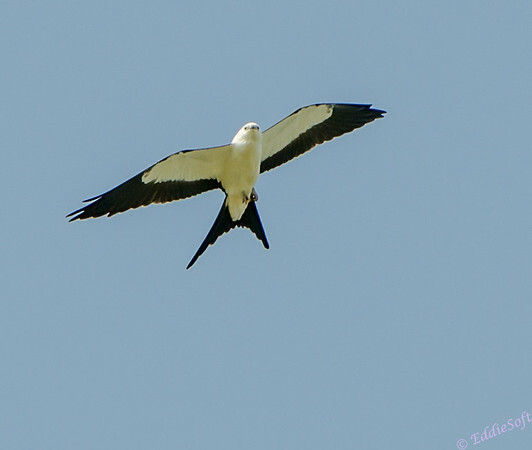 I showed you the chapter on this bird in the “Hawks in Flight” book I have, where the author simply raved about the bird, then apologized for raving on, and then continuing raving (for example, under his first picture his caption was “Swallow-Tailed Kite. Any questions?”). This is my top number-one bird ever. For the record, the Yellow-Crowned Night Heron at Kaufman Park was seen almost daily for about 3 weeks after this–for some reason it was out of sight when we were both there that weekend. Beautiful pictures!! Not only did you get to witness it (for two hours!) but you got fantastic shots as well! I thought for sure you were going to point out that the bird left the very next day after I made it down there. Honestly, I had NOTHING to do with its decision to depart for likely warmer locals. Base on the amount of dragonflies it was eating, it might have run out of food – must have been filling up for a long trek to the coast. I love the Space Ghost reference – that is a perfect comparison .. and of course you just dated yourself big time. I was bummed I missed the Yellow-Crowned since that was the original tipping point for me to make the trek down thee .. two +1’s – with that said, just seeing the Kite ended up being plenty of reason in itself.